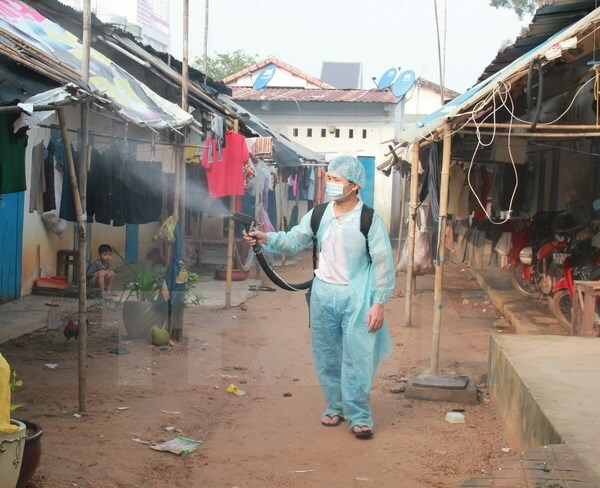 HA NOI (VNS) — The health ministry has sent 10 teams to inspect dengue prevention work in 20 cities and provinces, the Preventive Health Bureau has said. The cities and provinces that will be covered are Ha Noi, Thanh Hoa, Nghe An and Ha Tinh, besides Da Nang, Quang Ngai, Phu Yen and Binh Dinh, as well as Khanh Hoa, Binh Thuan, HCM City and Ba Ria-Vung Tau, along with Binh Duong, Binh Phuoc, Tay Ninh and Soc Trang, in addition to Long An, Tien Giang, Dak Lak and Gia Lai. The inspection teams will work with leaders of health departments and the provincial People's Committees to strengthen dengue prevention work and limit the number of infections and fatalities. The ministry said on Monday health agencies should collaborate with social and political agencies to launch mosquito and larva eradication campaigns. Local people should keep their homes clean, use appropriate waste treatment methods and clean water containers to eradicate mosquitoes. These sanitary activities needed to be done once a month or even every week depending on the area, the ministry said. Health agencies should increase inspections, promptly detect and prepare plans to help localities with dengue fever outbreaks, spray chemicals widely in dengue-hit areas, and provide training to health workers, it said. In addition, health facilities must provide prompt detection and treatment services to patients and work hard to minimise the number of dengue fever deaths. Health facilities also need to prepare good plans for classifying and giving consultation to patients so that the more severe cases are promptly treated.